Hello! I know it's been a while and I say this every time, but I am back and would like to try and blog more. So, my last post was about that cool little skirt. Unfortunately that is in the 'stalled' pile. First, I had to move so it got packed away. Second, the fabric was annoying me so much. It was sliding all over the place and I was getting more frustrated with it then loving it and that is when I decided to take a break and come back to it some other day. So, in the meantime I have taken on the HUGE project of making my own wedding dress. It's one of the biggest challenges I have ever faced and I am already learning so much. For obvious reasons, I won't post the style of dress I am making, but I will say it is going to be a vintage style with lots of gorgeous lace. I have drafted the pattern myself and am in the process of perfecting the toile. I have never boned a garment before and every day is a learning curve. Massive thanks goes out to all the amazing women at The Sewing Forum. Their advice and help has been invaluable. I would recommend all sewers to register there, it's a great place. As well as my wedding dress I want to make a cute 1950s style day dress for the day after I get married, and a 40s style playsuit for my honey moon. 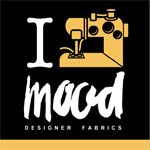 I bought some amazing fabric from Mood in New York - yes, I went - heaven! (will do a separate blog on this) and I really want to use it for these projects. Between now and September, I am going to be sewing like mad, but hopefully it will all be worth it. For my return to to my blog, I wondered what I would write about. Then the other day, during some pattern tweaking, I was using some cool dressmaker's tracing paper and it occured to me to write about the useful tools and tips I have been using to get good results. This is really useful when transferring the markings on your pattern onto your fabric. I used it to transfer markings such as straight grain, bust line, seam allowances, bust line etc onto my muslin toile pieces. It's very simple - you place the tracing paper under the fabric and use a tracing wheel on all the marks of the pattern. For slippery fabric I have been using a rotary cutter and mat to cut out my pattern pieces. Sometimes I find using scissors it will encourage the fabric to move (even though pinned) and you end up with different sized pieces. The rotary cutter ensures smoother straighter lines. I think making toiles are almost essential, especially when working with expensive or delicate fabric. Once sewn, some fabrics can not be tweaked or re-fitted or will show stitch marks. In that case it's best to make a toile to be certain of your fit. It might take double the time, but you'll have a perfect garment at the end and as my sewing teacher used to always tell me: sewing is all about patience! Essential for pressing curved seams, I'd be lost without my tailor's ham. My next step is to invest in or make some pressing aids for sleeves and other difficult bits. I pretty much tack everything before I machine stitch. Again, it takes longer but it's worth securing your seams before running them through the machine, which can invariably move your fabric as it moves across the teeth. I can also check that I have pinned correctly, especially tricky seams such as princess seams and armholes. I use a normal thread (a different colour to the fabric) and make small-ish bu accurate tacking stitches. Pins are so important! I make sure I always use good quality pins that are super sharp - okay, I'm hearing you say aren't all pins sharp?, well yes, but in sewing so many pins can leave horrible big holes in your fabric. Poor quality pins can also leave a mark on light coloured, delicate fabric, so it's worth checking your pins on a piece of scrap from your chosen fabric before you begin. Otherwise your project will be doomed to the 'mess up' bin - I don't think there is anything out there that can remove those marks. This has been amazing! I have always wanted one of these and thought I'd get one now seen as I would be pinning alot and usually my pins get everywhere! This is really handy - it's a really strong magnet that keeps all your pins together. I also use it to hover over the floor to pic up any stray hazards! My fiance doesn't have to walk like he's crossing a mine field now. Okay, so how can charity shops help you sew. Well, today I popped into my local Oxfam and got a bargain in cheap scrap fabric. I got metres of this heavy cotton that will be perfect for making toiles as well as some old net curtains, which will be great for experimenting with the patterns for my wedding dress lace. A great tip I got from The Sewing Forum. All this I got for £3! It's worth checking your local charity shops for old curtains, sheets that can be used in this way. As I mentioned before patience is one of the greatest tools you can possess. You may have to re-pin a seam six times, or unpick a mistake, or even start all over again, but it's the only way you will get a really great garment. As we all know, mistakes show in sewing and it's easy to spot a poorly made garment. With some patience you can ensure that everything you make will look amazing and has been done to the best of your ability.